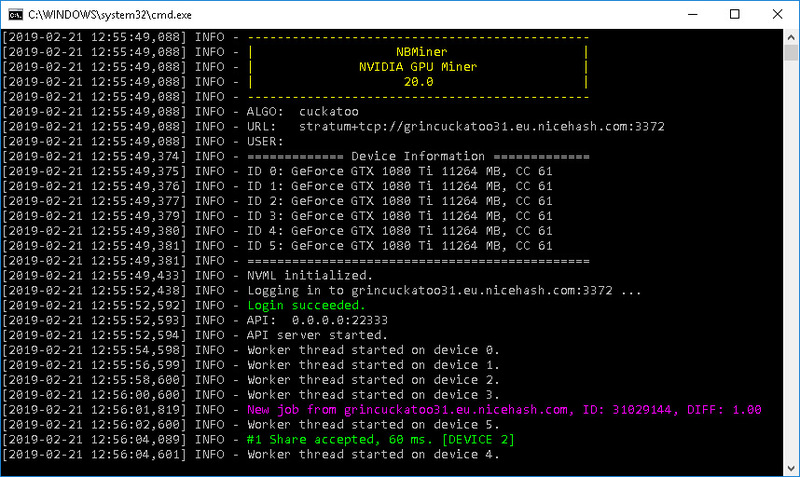 The newest NBMiner 21.4 update comes with further improvement in the performance for Grin31 mining (Cuckatoo31 algorithm), though slight one from what we are seeing, the miner is still probably the fastest Nvidia GPU miner for Cuckatoo31. 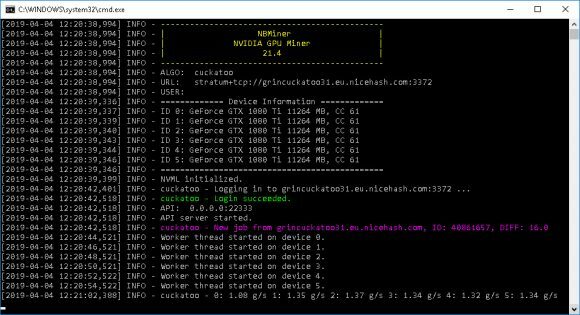 There is also performance improvement for Grin29 (Cuckaroo29) and AE (Aeternity) on Nvidia RTX cards and the current level of performance is almost on par with other competing miners in terms of hashrate on GTX 1080 Ti GPUs, though the latest GMiner 1.36 still has a slight performance advantage on GTX 1080 Ti under Windows at least. 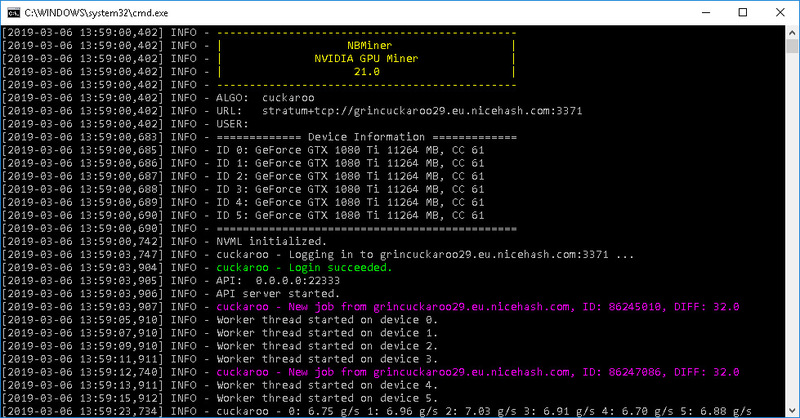 NBMiner v21.4 also fixed Grin31 compatibility on Windows 7 with 8GB video cards and comes with a new option to reduce the range of power consumption by multi-gpu rig (--cuckatoo-power-optimize). The use of this option could prevent power spikes from causing problems with power supplies that are near their limit and thus can help improve mining system stability, though there may be some drop of mining performance as a result, so do try the option and see it it helps or not improve system stability and ho it affects mining performance in your case. 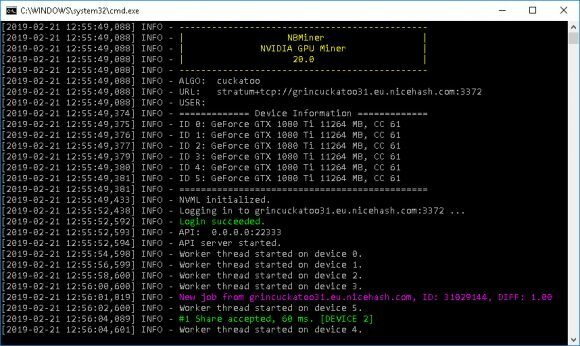 We remind you that the NBMiner is a closed source GPU miner for Nvidia CUDA that is available for both Windows and Linux operating systems and it has the following developer fee built-in: tensority + ethash – 3%, tensority (Pascal GPUs) – 2%, tensority (Turing GPUs) – 3%, ethash – 0.65%, cuckaroo29 and cuckatoo31 – 2%. The latest NBMiner 21.0 that has just been released comes with support for Aeternity (AE) as well as improved miner stability and performance for the Grin29 and Grin31 algorithms (Cuckaroo29 and Cuckatoo31). 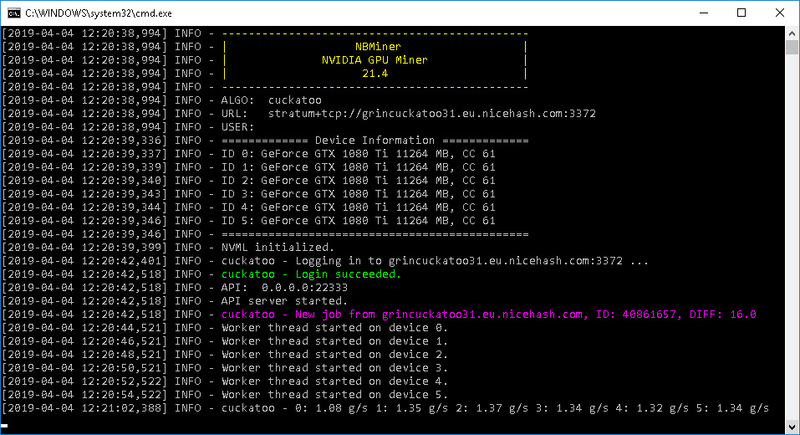 Performance wise the new version does seem to catch up to the competition regarding Cuckaroo29 hashrates (the latest Gminer is still slightly faster) and could currently be the fastest miner for Cuckatoo31 in terms of hashrate (at least for Windows on GTX 1080 Ti) compared to BMiner and GMiner. Stability wise Cuckatoo31 however could use some more improvements as we see the miner crashing on some systems that otherwise work just fine with competing miners. 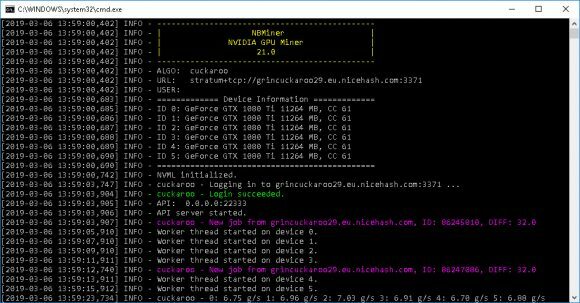 The latest NBMiner 20.0 has just been released with support for Grin’s Cuckatoo31 algorithm (Cuckaroo29 was already supported) as well as support for mining Grin on NiceHash. The new version also comes with an option to tune CPU usage when mining Grin, improved BTM+ETH dual mining performance on Nvidia RTX video cards s well as some bug fixes. Regarding Cuckatoo31 performance, you can expect to get similar hashrate as what the previously fastest BMiner 15.0 miner provides, however stability wise NBMiner does seem to be handling better based on our initial impressions from the new version under Windows 10.